Our annual international conferences and research colloquiums are designed to bring together researchers, clinicians, patient groups and patients/carers in order to make progress in research into ME. All conferences have been held in London and have been CPD-accredited. Our conference trailer below was made to celebrate our tenth year as a charity. The views expressed at the Invest in ME/Invest in ME Research International ME Conferences and at other Invest in ME/Invest in ME Research conferences and Colloquiums by the presenters and delegates to the Colloquiums/Conferences and any information material distributed are their own personal opinions that are not necessarily shared or endorsed by the Trustees of the charity. Invest in ME/Invest in ME Research accept no responsibility for the views expressed or any subsequent action taken. The contents of any presentation should not be deemed to be an endorsement, recommendation or approval of such content by Invest in ME/Invest in ME Research. 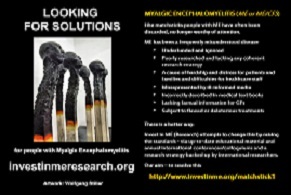 The materials presented at the Invest in ME/Invest in ME Research International ME Conferences or by contributors to this web site do not constitute medical advice. No medical recommendations are given or implied by Invest in ME/Invest in ME Research. Any person registering or attending the conferences or who use information from this web site and who may take any action or consider medical treatment or referrals should take detailed advice from their own medical practitioner always. Invest in ME/Invest in ME Research disclaims any implied guarantee about the accuracy, completeness, timeliness or relevance of any information contained in this website. To purchase and pay online use the boxes below or pay by cheque. Please help us in raising funds for biomedical research and for performing activities related to biomedical research. 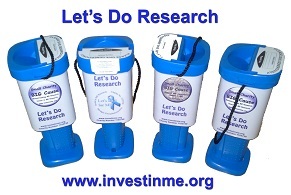 By buying an Invest in ME Research wristband you will be helping IiMER in its work as well as promoting the message that biomedical research into ME is the only way to make real progress in finding treatments and cures for this illness - via our Centre of Excellence for ME. Sell them to friends, family, work colleagues - even in your local library, GP surgery or hospital. These IiMER wristbands may be purchased in packages of 5.